Since its appearance in 1859, Darwin's long awaited treatise in "genetic biology" had received reviews both favourable and damning. Thomas Huxley and Samuel Wilberforce presented arguments for and against the theory in a dramatic and widely publicised face-off at the 1860 meeting of the British Association for the Advancement of Science in Oxford. Their encounter sparked a vigorous, complex debate that touched on a host of issues and set the stage for the Royal Society's consideration of whether or not they ought to award Darwin the Copley Medal, the society's most prestigious prize. While the action takes place in meetings of the Royal Society, Great Britain's most important scientific body, a parallel and influential public argument smoldered over the nature of science and its relationship to modern life in an industrial society. Marsha Driscoll is professor and chair of psychology at Bemidji State University, where she is also director of the Honors Program. Her scholarly interests include the nature and role of cognitive and affective empathy, adult development, and the interdisciplinary connections of psychology to the other social sciences, humanities, and natural sciences. Elizabeth E. Dunn is the dean of the College of Liberal Arts and Sciences and professor of history at Indiana University South Bend. Her main area of scholarly interest is American intellectual history, particularly value conflicts raised by issues such as paper money and itinerant ministers, but recently she has spent a lot of time trying to figure out what makes a university tick. Dann Siems was assistant professor of biology at Bemidji State University. His research interests included the natural history of fishes, phenotypic plasticity in life history theory, relationship of ontogeny to phylogeny, history, and philosophy of biology, role of behavior and cognition in evolution, and evolutionary psychology. 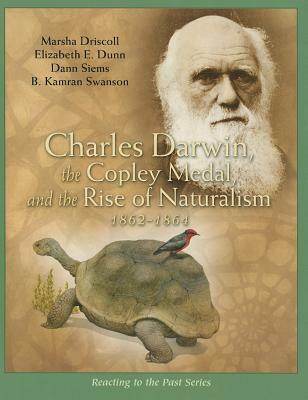 Charles Darwin, the Copley Medal, and the Rise of Naturalism, 1861-1864 is dedicated to his memory. B. Kamran Swanson is assistant professor of philosophy at Harold Washington College in the Chicago area. His studies have focused on the philosophy of Benedict Spinoza and other seventeenth-century philosophers.